Springtime means fresh produce. That includes two of the year’s most anticipated treats: homegrown asparagus and spinach. Both are abundant right now in the part of the US where we live. There’s terrific local asparagus from farmers’ markets. And spinach? Well, our backyard garden is producing a bumper crop. Both asparagus and spinach are wonderful when served alone—but combining them in a salad makes for something special. Add some salty prosciutto and a poached egg, and voilà: a savory salad that you can serve as a small starter or a larger main course. But hurry! The season for fresh local asparagus is short, and you don’t want to miss out. Otherwise you’ll have to wait until next year. Don’t say I didn’t warn you. This salad is similar in concept to Salade Frisée aux Lardons, which we discussed last year, although the ingredients are mostly different. As is the case with that salad, you can skip the poached egg if you want a less hearty dish—although you miss some of the fun and flavor the egg brings. You can use thin or thick asparagus for this dish, though I prefer stems that are approximately the diameter of my little finger. When thin asparagus is fresh (that is, harvested within a day—or two at most—of serving), you almost don’t have to cook it—it’s that tender. This recipe is very simple. 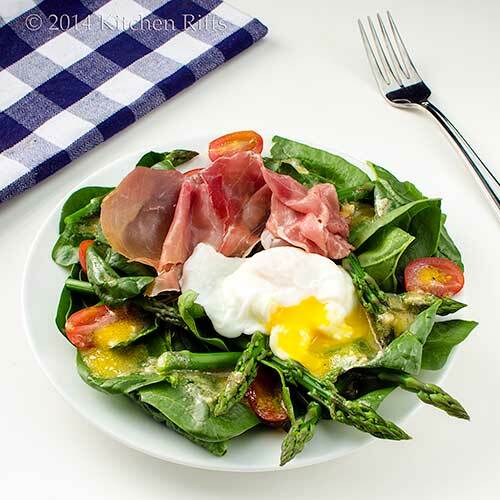 You just toss spinach with vinaigrette, plate it, add asparagus (tossed in vinaigrette or not—your choice), and top with prosciutto and poached egg. Garnish with tomato if you like. You don’t need to follow exact measurements, particularly for the spinach and asparagus. Just use amounts that appeal to you. This recipe serves two, although you can easily double or triple it. Wash, dry, and chill the spinach at least an hour before you plan to serve the salad: Remove any stems that are too woody, then tear the spinach into small pieces (or leave whole if using baby spinach). Wash and dry the spinach, then chill in the refrigerator. Peel the garlic clove and mince it finely. Place it in a small bowl or jar that has a lid. Add the mustard, red wine vinegar, and olive oil. Put the lid on the bowl/jar and shake to emulsify the salad dressing. Taste, add salt and pepper to taste, and set aside (refrigerate the dressing if you don’t plan to assemble the salad right away). All of the above steps can be done hours ahead of time. We’re also assuming that you have poached and cooled the eggs (see recipe headnote). When you’re ready to assemble the salad, half-fill a small saucepan or skillet with water, and put it on the stove to heat (this is for warming the poached eggs; see Notes for timing if you want to poach the eggs as you assemble the salad). Bring the water just to a simmer. By now, the water should be simmering. Slip the cold, previously poached eggs into the water to warm for 1 minute (set a timer so you don’t forget them). 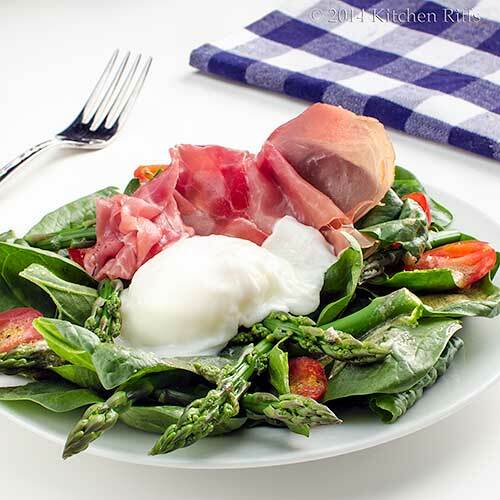 While the eggs are warming, drape the prosciutto slices over the spinach and asparagus on the serving plates (if you prefer, you can cut the prosciutto into bite-size pieces and sprinkle it over the salad). When the poached eggs have warmed for a minute, remove them from the water with a slotted spoon. Drain them briefly on a kitchen towel (or paper towel), and top each salad plate with an egg. Sprinkle each salad plate with some grape or cherry tomatoes (if desired) and serve. If you don’t want to poach the eggs ahead of time, just do the entire cooking process as you begin to assemble the salad. Following the instructions in the post on Poached Eggs, bring water to a simmer (in Steps 4 and 5 of this recipe). Add the eggs to the water and cook for 4 minutes while you assemble the salad. Then remove the eggs with a slotted spoon, drain them on a towel, and top each salad plate with an egg. I like garlic in this vinaigrette, but if you want something more subtle, substitute shallot. Use about 2 teaspoons, minced finely. Adding mustard to the vinaigrette helps form an emulsion (as well as providing great flavor). The addition of mustard is what allows you to make the dressing by shaking it up—oil and vinegar wouldn’t combine otherwise. If you prefer, you can make the dressing by whisking the mustard and vinegar together, then whisking in the oil drop by drop. You can toss the asparagus in vinaigrette if you choose. To do so, first toss the spinach with the vinaigrette (Step 5). Then add the asparagus, along with a bit more vinaigrette, and toss lightly. Alternatively, you can toss the spinach in vinaigrette and plate it. Then add the asparagus to the plate and dab it with some of the vinaigrette. Or plate the spinach, then in the same bowl toss the asparagus with a bit of vinaigrette, and add it to the plated spinach. The fresher the asparagus, the better. But how do you know when asparagus is fresh? Two things to look for: One, are the tips nice and tight? They should be. Second, are the stem bottoms white and fresh looking? Or are they cracked and brown? Buy the first, avoid the second. If you can’t cook asparagus right away, store it standing up in a container of water in the refrigerator. Baby spinach is wonderful in this dish, but more mature spinach works well too, as long as it’s fresh. Want an alternative garnish for this salad? Try Homemade Croutons. “I’m glad spinach is so cold hardy,” said Mrs. Kitchen Riffs, munching her salad. What a hare-raising prospect. Guess we’d better hop to it. Oh boy this is so lovely... just my type of food, simple, nutritious and cane be made in no time. I hate time consuming recipes specially when they do not worth the trouble :). Thanks John. Hi Amira, this really is a fun recipe. And really easy to switch things around to suit your taste. Thanks for the comment. Skip the egg? NO way John; looks absolutely fabulous. I'm loving having salads for dinner with fresh fruit and veggies and this combination is absolutely going to make an appearance...thanks! This is beautiful and sounds just amazing John. I love everything about it!! Love that shot from above! I would give you a $100 for one of these right now ... all my favorite things on a plate! Beautiful! Hi Barb, yeah, that egg is pretty hard to skip, isn't it? Thanks for the comment. Hi Chris, I'm a sucker for overhead shots, I admit, so I almost always do one per post. Thanks for the comment. Hi Kimberly, isn't this great? And worth $100, too! ;-) Thanks for the comment. Hi Dana, isn't this great? Perfect for lunch! Thanks for the comment. Mmmm, spinach from your own garden—you are a lucky man. Spinach and asparagus are on the top of my list of favorite green foods, and I love your salad! I do something like this with the poached egg, but I sauté the greens in garlic and olive. It makes a great lunch. "Prosciutto and poached egg add savor to springtime favorites" - I couldn't agree with this more! I have a couple of recipes coming down the pipeline that use both of these lovelies. They do seem to radiate spring - perhaps because they both go so well with asparagus? In any case, I adore this salad you've created and will definitely be adding it to our menu! 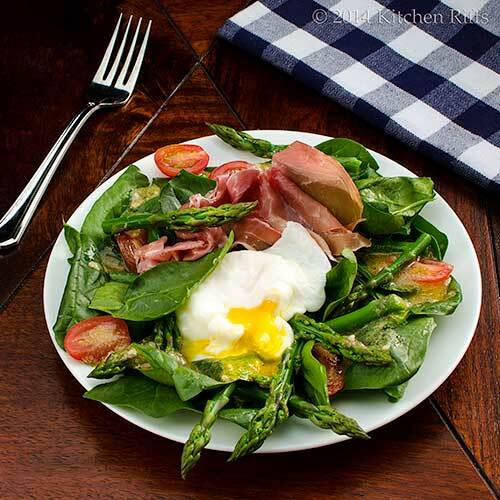 All the good stuff is in this salad: Eggs, prosciutto, asparagus... I mean, it's a quite tasty, complete meal! I just picked some of our spinach, but alas I have no asparagus. I am making this dressing for our salads tonight though. Hi Mireya, we are indeed lucky to have space for a garden! I like to sauté greens too, but would probably do that with Swiss chard (which we also grow). Although cooked spinach is wonderful, I just can't get enough of it raw in salads! Thanks for the comment. Hi Minnie, this really is a terrific salad. So flavorful! Thanks for the comment. Hi Kristy, those two ingredients add savor to anything! But they're both so wonderful with asparagus (and spinach!). Look forward to seeing the goodies you're working on. ;-) Thanks for the comment. Hi Nee, I can never resist a poached egg! Not only do they taste so good, they look gorgeous too. ;-) Thanks for the comment. Hi Denise, this really is a complete meal. And such a good one! Thanks for the comment. Hi Debra, this really is a wonderful dressing. I use it all the time with plain spinach salad (sans the asparagus, egg, etc.). Thanks for the comment. I have been enjoying asparagus almost every week. But its season is so fleeting, I figure I have to get my fix in when I can. This salad looks like a great way to use a bunch. Your poached eggs look GORGEOUS! Eggs and spinach are such a wonderful combo - with asparagus and this red wine/garlic vinaigrette sounds fabulous! More salads are eaten in the spring and summer. Shocker I know, but I do crave them more, I think it's because we know the tomatoes will be just fabulous. Hi Carolyn, we've been gorging on asparagus too. ;-) Gotta get it while we can! Thanks for the comment. Hi Shashi, poached eggs add so much flavor, don't you think? Lovely with both spinach and asparagus. Thanks for the comment. Hi Dawn, we really do eat a ton of salads at this time of the year. And I'm hoping for a great crop of tomatoes from our garden! Thanks for the comment. Ah, yes. Rabbits are upon us. Rabbit catcher is having a hard time since now they have learned to stay out of the yard, except at night. And we saw evidence of a coyote judging from the fur laying all over the yard. But this salad sure looks good, so i am glad you put up that fence! Perfect, perfect summertime salad. I wish it were summer here right now so I could join right in with you two. All my favorite ingredients in one plate. Now I'm craving for some asparagus! A beautiful spring salad! Really mouthwatering. OMG! Look at this gorgeous salad! Looking for salad recipes all the time, this is going to be made soon at my place. Thanks for sharing! Yum. This reminds me of the hot spinach salad we have been eating this Spring. love the addition of asparagus! Hi Abbe, we have problems with rabbits for the green stuff, squirrels for the tomatoes. So I didn't just build a fence -- I build a cage out of PVC pipe that is covered sides and top with heavy netting! I'm sure the squirrels will figure out a way to outwit that, though. :-( Thanks for the comment. Hi Renalyn, spinach is pretty good no matter what we call it, isn't it? Thanks for the comment. Hi Kumar, glad to sing spring to you! Great line. ;-) Thanks for the comment. Hi Maureen, oh, it won't be long before the seasons change again and you'll be eating this. ;-) Thanks for the comment. Hi Indrė, aren't there a lot of good flavors in this dish? I love it! Thanks for the comment. Hi Bam, I'll bet each of your teenage boys could eat this entire recipe and come back for more! Love the idea of adding chicken to this, BTW -- great idea. Thanks for the comment. Hi Rosa, it really does sing of spring, doesn't it? ;-) Thanks for the comment. Hi Asmita, we eat so many salads at this time of the year! So we're always looking for new recipes too. Thanks for the comment. Hi Candy, :-) Thanks for the comment (and bookmark!). Hi Alyssa, we make a hot spinach salad with bacon dressing that is somewhat simlilar to this. Great dish! Thanks for the comment. I absolutely love this salad... can't wait to try it. Bookmarked. The salad looks absolutely beautiful and delicious! I am glad that I have stumbled upon your blog, you have a nice collection of recipes :)! Hi Pam, it's such a great dish! Tons of flavor. ;-) Thanks for the comment. Hi CG, it's truly good -- you'll like it. Welcome, and thanks for the comment. Hi Rocquie, I used to poach eggs maybe once every 5 years or so. Just not something I did all that often for some reason. But the last couple of years I've been poaching them all the time! They're easy, tasty, and pretty. ;-) Thanks for the comment. Now that's what I call a salad. I totally missed your post on poaching eggs. I love a good poached egg and I sort of know how to make them but I always struggled with the timing so thanks for that brilliant reheating tip! Hi Simone, being able to prepare poached eggs ahead of time and then reheat them right before serving is such a convenience! Makes everything a lot simpler IMO. Thanks for the comment. Well you got me. I clicked on your post. I wrote down the title of the recipe. Then I scrolled down further and saw the egg and prosciutto. Yep, I was major surprised. I love surprises. In my life they are always something good. And hey look this fell into that category. What a mix of flavors and textures. The yellow of the egg with the greens---Wow. I may have to rethink the colors in my kitchen. Lol. Hi Carol, nice additions to the salad, huh? ;-) And you're right that there's a ton of flavor going on here! Thanks for the comment. John, this salad looks so green and summery. I love asparagus and oh, mustard and garlic in this salad sounds great! A good poached egg makes my meal complete!! Fresh asparagus is so wonderful, I love eating it exactly as it is. But this recipe is a worthwhile exception. It looks both simple and hearty - and the poached egg is a lovely surprise! This looks like an ideal summer meal! Beautiful, healthy and ultra delicious! You've done it again! Hi Nami, this would be great for your own lunch! Enjoy. ;-) Thanks for the comment. Hi Julie, yeah, our bunny "friend" have been pretty unhappy lately. Too bad! More for us. ;-) Thanks for the comment. Hi Charlie, oh, there's plenty for the bunnies to eat. They just want to feast on our salad greens! Can't say I blame them. :-) Thanks for the comment. Hi Purabi, this really is a good dish -- I love all the ingredients! And they play so well together. Thanks for the comment. Hi Beth, we eat asparagus all by itself most of the time. In fact, we had some last night! But it works quite well in a composed salad, too, so it's a fun ingredient to include. Thanks for the comment. Hi Liz, isn't this terrific? Such loads of flavor! Thanks for the comment. Hehe love the vegetable garden and bunnies animosity! Also, I'm always impressed by how much history you can give. I've always wanted to ask how you go about researching for your posts! That poached egg looks fantastic. Bet the rabbits are jealous! Hi Ala, heck, you're in grad school -- you know all about research! In my case it's just cooking a long time, eating (and paying attention) for a long time, and loads and loads of reading. And although you have to weed out the noise, the internet will get you on the road to anything you don't know about pretty quickly. And yes, the rabbits are jealous! Thanks for the comment. I have been eating more than my fair share of asparagus. In fact I'm having some tonight with cauliflower alfredo. Love it with a poached egg too! Hi Laura, that sounds like a terrific dish! Hard to resist asparagus at this time of the year, isn't it? Thanks for the comment. What a beautiful springtime salad, and the egg just puts it over the top. Also your conversation with Mrs. RIffs about your rabbit population made me laugh out loud! Hi Ray, isn't there a bunch of good stuff there? Really a great salad. ;-) Thanks for the comment. Hi Adri, glad we made you laugh out loud! ;-) And poached eggs add so much pleasure, don't they? Thanks for the comment. Perfect springtime salad. The combination of asparagus with poached egg can't be beat if you ask me! 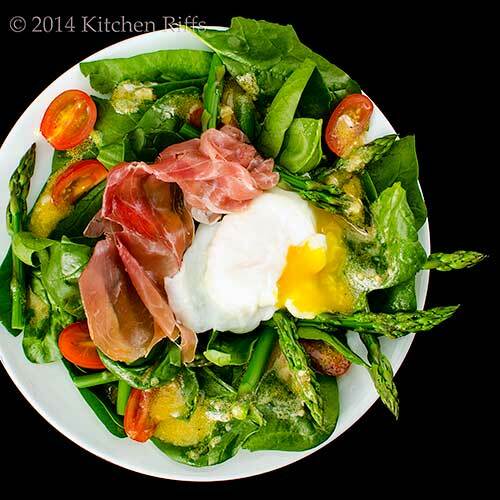 Hi Kristi, asparagus and poached egg really is an awesome combo! I love it! Thanks for the comment. Hi Pat, it really is a good salad. And fresh spinach has such wonderful flavor! And plays so well with all the ingredients in this dish. ;-) Thanks for the comment. Your salad is the ideal spring, summer and just plain warm weather meal! I love every single ingredient in it. Thank you for sharing, John! What a lovely salad John!!! I don't have any spinach, but my BIL just brought over a large head of Romaine that he picked from his garden this morning and yesterday I bought some beautiful young asparagus. Looks like supper tonight - seriously!!! Thanks for sharing and your pictures are always beautiful, but this salad just screams - "I'm so pretty, very pretty." Hi Nancy, isn't this great? I love every single ingredient in it too! ;-) Thanks for the comment. Hi MJ, I think Romaine would be a nice substitute, plus you have some great texture with it. I hope you enjoy this! And isn't this pretty? ;-) Thanks for the comment. Oh those bunnies are giving me the evil eye too. I keep telling them if you eat my veggies I will have to eat you, but they ignore me! Beautifully poached eggs on a gorgeous salad. Asparagus and Eggs are a match made in foodie heaven! Hi Ansh, those bunnies are something, aren't they? ;-) Asparagus and eggs really are a wonderful pairing. Thanks for the comment. Hi John. Can you believe I've never combined these two spring classics? Love the idea and the photographs are beautiful. Thank you for sharing! Hi Monet, you really owe it to yourself to try the two of these together! Awesome combo, IMO. Thanks for the kind words, and comment. I love this salad. Asparagus is always such a treat in the spring time. Hi Dawn, asparagus is one of those things I always look forward to. I rarely (if ever) eat it out of season, but in season every week! Thanks for the comment. We had guests for dinner last night and today I was planning to whip up something lighter and healthier to make up for the extra wine and food we indulged in:D I love this recipe!! Fresh, spring, lightly poached egg.. everything for the perfect healthy light dinner! Thanks for sharing with us! I love salads with egg in it, especially one with a gooey yolk. and egg combiines so well with asparagus too! Hi Smidge, this is a great dish to eat the day after a big blow out! Tasty and satisfying, but not hugely caloric. Thanks for the comment. Hi Chopinand, eggs in salads are one of my favorite things. And I totally agree that eggs and asparagus are a wonderful combo. Thanks for the comment. That is great that you are able to grow your own vegetables! Someday I also want to have a food garden :) What a great salad, thanks! Hi Kristi, having one's one veggie garden is so nice! It's worth it for the tomatoes alone, but having your own early season spinach and radishes is way cool. ;-) Thanks for the comment. What a great salad John and A+ for presentation. Hi Madonna, isn't this a nice dish? Lovely flavors! Thanks for the A+! And for taking time to comment. A poached egg on a salad is one of the most indulgent dishes we serve at the cottage, I simply adore it. It's quite beautiful too. I've par poached eggs for a larger group (pop them into an ice bath to stop the cooking process and store in the fridge) finishing them at the last minute in hot water. Poor bunnies (I do have a huge soft spot for them!) you should definitely plant some of their favourites, that carrot top is quite foreboding! This looks so decadent and delicious, John. And guess what we are eating every single day right now, because it is coming on gangbusters in the garden? I can't wait to try this with some! Hi Eva, yup, par poaching is a technique I discuss in my poached egg post, and advocate for this recipe. Works really well, doesn't it? The rabbits actually have loads of good stuff to eat. We're just trying to save our garden stuff for, well, us! ;-) Thanks for the comment. Hi Donalyn, we have spinach galore! Going to do a spinach and Swiss chard stir-fry for dinner tonight, and probably add some pork to it. And probably do this salad again soon -- it's terrific! Thanks for the comment. What a terrific salad and I love it with the egg. I can't say I've ever had an egg on my salad. Love the idea. Thanks for sharing this. Hi Vicki, poached (or fried) eggs really work well on salads, IMO. Definitely worth a try! Thanks for the comment. Hi Raymund, two eggs would be good. ;-) Particularly if you want to turn this into a main course salad. Thanks for the comment. Hi Terra, isn't this pretty? Tasty, too! And an egg really does add something. Thanks for the comment. What a beautiful spring salad this is! I love, love LOVE asparagus and it is so good with eggs. Hi John, I'am Chantal from Travelling Papilles, I just discover and like your beautiful blog. Your colorful and healthy salad looks so yummy! Hi Amy, asparagus and eggs is such a great combo, isn't it? Thanks for the comment. Hi Chantal, welcome! Isn't this a great salad? Thanks for the comment. Hi Shibi, we're getting a great crop of greens at the moment (spinach and Swiss chard in particular) and have our tomatoes and most other stuff in (although I think I'll have to replant cucumbers -- their growth got stunted by colder-than-usual weather). Thanks for the comment. What a beauty.. and a great idea on how to use spinach from the garden! Gonna eat this up! Hi Pam, isn't this great? It's not possible to have too much spinach, but we almost have too much, so it's a great way to use some. ;-) Thanks for the comment. POACHED EGGS ARE SO FLIPPING GOOD! I love YOLKS!!!!! Yolks are the BEST dressing on greens, EVER! Hi GiGi, tell us what you really think about poached eggs. :D I agree, they go so well with greens. Thanks for the comment. Now that's my kind of salad. I could make a breakfast, lunch, or dinner out of this salad. Spring asparagus is one of my favorite foods. It's also a beautiful salad and your photos are fantastic! Great post, John! Hi Bill, I could eat this salad for any meal, any time of the day, too! It's really loaded with flavor. Thanks for the kind words, and for taking time to comment. Wow, wow, wow, wow!!! How did I miss this... a beauty. Pinning for our warmer season. Hi Lizzy, this is a great salad -- you'll love it when asparagus season rolls around for you. Thanks for the comment. Unfortunately our asparagus season is well and truly over but I know that my husband would adore this gorgeous salad... it's pretty much got most of his favourite things! Beautiful styling John. I'm glad that you're enjoying the seasonal veg, you've waited long enough for it! Hi Laura, this really is a great salad, and if your asparagus is truly fresh it's ambrosia! Thanks for the comment. Dear John, I made this salad tonight and it became an instant hit. I'm a great fan of the Dijon mustard based dressing. Right now, it's the season of the white asparagus (where I live). Would you think it's a good idea to substitute white asparagus for green? Hi La Torontoise, isn't this a nice salad? I haven't tried this with white asparagus (and I suspect what we get in the US isn't really the same as what you're getting), but it's an interesting idea. My instinct says the green might be better, but I'll bet the color of the spinach and white asparagus would be wonderful. I'd give it a try and see what happens (my usual method in the kitchen; I sometimes have great success, but sometimes disasters). Let me know if it works! And thanks for the comment.